I had good intentions of completing a quilt from 2010 but while looking for binding fabric for the quilt, I ran across a set of simple "Puss in the Corner" blocks I won at a CTA retreat in 2006 (completing the quilt top will be my Elm Street Quilts OMG). The theme of the retreat was cherries and the instructions were to make as many blocks as we desired. The number of blocks we made determined the number of entries we had in the drawing for all of the blocks. 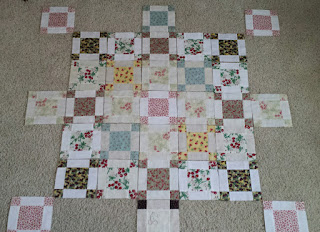 I won the blocks, more cherry themed fabric, and the signature block placed center bottom. 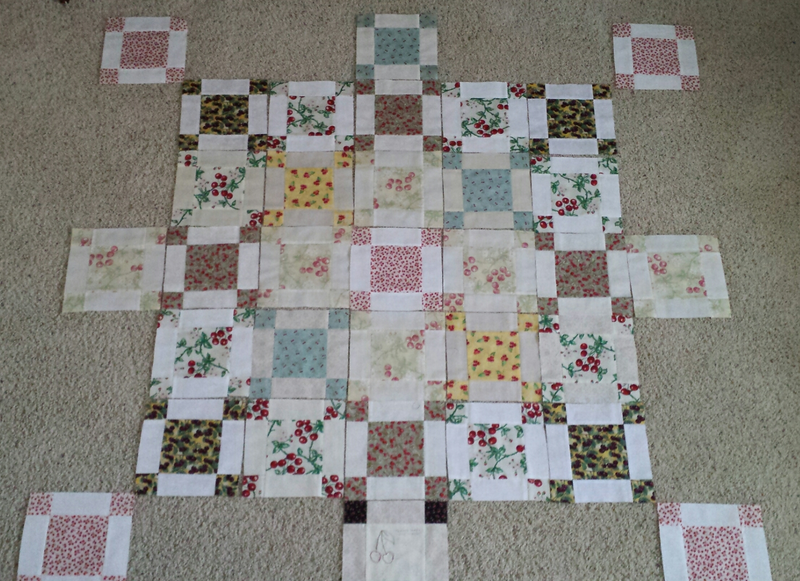 After much indecision, I have decided on a simple arrangement from this 9 patch variation. There will be a narrow black border so the center blocks appear to float. I thought about sashing but decided that I liked the scrappy 4 patches created by the corner squares and that maybe this quilt didn't need to be spectacular, just finished and put into use next winter when I curl up in my favorite chair to knit and listen to an audio book. Bonnie at Quiltville has a spectacular version of "Puss in the Corner." Digging into our boxes and stash sure does seem to reveal lots of fun in the form of UFOs! I hope you have fun finishing your Puss in the Corner quilt! This sweet quilt will be wonderful to cozy up with a novel next winter! Sweet quilt top. 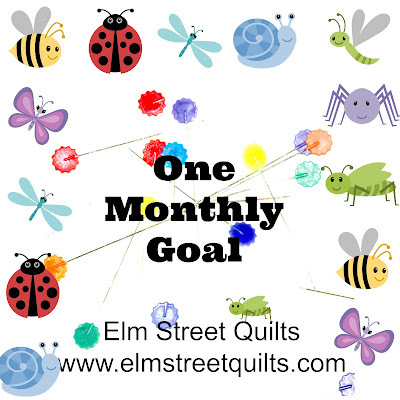 Thanks for linking up with Elm Street Quilts One Monthly Goal and good luck on your project.